During the summer a lot of 3 on 3 tournaments are held, so I've put down some basic plays. Player 1 makes a dribble to get a better passing angle. Player 2 makes a V-cut to receive the ball. Player 1 passes the ball to player 2 and sets a screen on the defender of player 1. 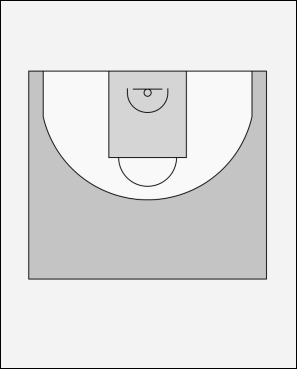 Player 2 uses the screen of 1 and dribbles to the top of the bucket to get a good passing angle for the pass to 3. Player 3 makes a v-cut to get open. After the pass player 2 sets a screen on player 3. Player 2 should not forget to look for his own chance and the pass back to 1 who has rolled to the basket or to the outside. 3 uses the screen of 2 and drives to the basket and makes a lay-up. Player 2 rolls to the basket and player 1 goes for the rebound. In this case after only 2 passes the player goes for the basket. During a real game you might have to pass 5 or more times to get the defense tired and make the basket.